Badbeat.com has started its spring recruitment efforts and is offering winning cash game and tournament players the chance to change their lives and become part of its stable of sponsored poker pros. Poker staking is an important part of the modern professional poker ecosystem, with many of today’s top and up-and-coming poker talents enjoying the financial backing of a major online poker operator. Indeed, most of the game’s biggest stars find their way to the main event tables of major tournaments this way, but at a more real-world level, Badbeat.com sponsored players enjoy the type of practical staking that helps their game develop without risking the loss of their own finances. As part of their Q1 recruitment drive, Badbeat.com is scouting for players. Winning No Limit Hold’em cash game players at $0.25/$0.50 or above, or winning tournament player at $20 buy-in or above and can prove so with statistics such as Hold'em Manager or Shark Scope, can register as a member of Badbeat.com and submit a ‘Route One’ application form found in the “Get Sponsored” page at www.badbeat.com. • Depositing to PokerTime account and playing at least 5,000 real money cash hands. 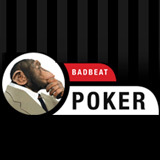 Once players have at least 5,000 hands recorded in their MyPokerLab account, they can then register as a member of Badbeat.com and submit a ‘Route Two’ application form. Why would a winning player would need staking? Many players don’t like risking their own money when just a few bad beats and lost coin flips can turn a winning session into one that decimates a bankroll. Badbeat.com provides its sponsored poker players with a fixed amount of money per day to eliminate their personal risk at the tables, freeing them up to play their ‘A-game’. Poker staking often comes to the aid of those with limited financial funding who are struggling to progress because their play is dictated by the size of their bankroll (risk), but would have the potential to move up the levels once freed up. Players that can beat the lower stakes games but can’t afford to lose your bankroll taking a shot at the big games, and winners that struggle with bankroll management and go on Isildur1-like runs of swings well outside their comfort zone, can change their life and give the big time a shot by applying for the Badbeat.com staking system where world class poker mentors will guide them to their own pro poker career.